Family memories are a precious part of a family’s legacy and they deserve to be carefully preserved. Memories can help keep cultural and personal traditions alive, connect multiple generations (even those who have never met!) and help family members better understand who they are by knowing their past. Especially as loved ones age, it can be challenging to collect and organize historical family memories in a cohesive way. 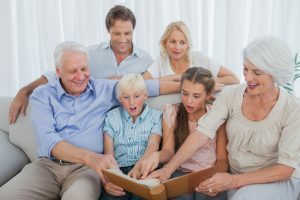 Here are some suggestions for how you might connect with older family members or use memorabilia to preserve your family’s memories. Interviewing older family members is one of the best ways to gather family stories and descriptions of day-to-day life and historical events from another generation. Consider creating an audio or video recording of the interview – you could even use your smartphone. Recruit younger members of your family to do the interviewing and provide them with some sample questions to get the conversation started. Here are some sample family interview questions to consider. Few of us use home movie projectors or camcorders today, but those old tapes are still valuable! For a small cost, home videos can be digitized so that future generations may enjoy them. If you’re technically savvy and have access to the right equipment, it’s possible to digitize the movies yourself. Otherwise, consider mailing your old movies to a company such as LegacyBox. They will digitize family movies for you and can even create still photographs from your favorite home movie scenes. Collecting photographs, letters and other memorabilia and compiling them into an archive is a worthwhile investment in time. It may be helpful to connect with older family members to identify the people in the photographs and to come up with approximate dates for each item. If you have access to a scanner, you could create digital copies of this memorabilia to share with other family members. Use a cloud-based backup service or a shared Google Drive as the hub for your digital archive and you’ll always have an electronic copy of those priceless memories. If you have family heirlooms such as your great grandparents’ silver tea service, an assortment of antique dishes, artwork or any sort of collections, you could create a photo journal to document these heirlooms for future generations. In the journal include photographs of each item alongside a short story describing how it was acquired. The photo journal will be easier to share with various family members compared to the actual items. Digitize and share favorite family recipes, or compile them into a family cookbook. Trace your family tree – you may even discover some long lost relatives in the process. Visit the hometown of your grandparents or great grandparents and gather stories about the place. Record the voices of your children, siblings, parents and grandparents reading a favorite book or even answering questions about themselves. Make copies of the recording so that future generations can hear their voices. Trace your ancestry and DNA. At Lighthouse Senior Living we understand that family memories are an important part of the fabric of any family and any community. We provide our residents with a supportive and caring environment and encourage family involvement in our community activities. Schedule a tour today to learn more about our lifestyle and culture.